Welcome to the Fortnite Season 6 Week 4 Challenges: Battle Star Treasure Map & Shooting Gallery & Doorbell & Dancing Locations Guide. Here you will find out how to get to the Shooting Galleries & Doorbells & Dancing & Treasure Chests Locations in Fortnite Battle Royale on PS4, Xbox One, PC, Mac, Switch & Mobile. 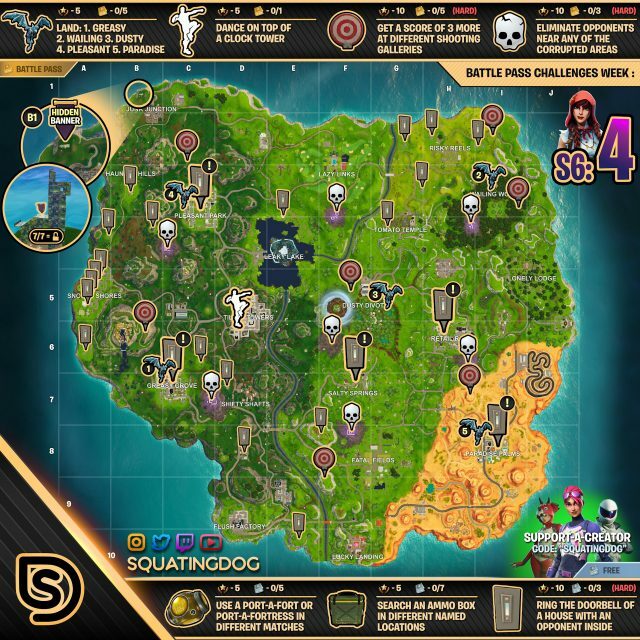 How To Find Search Challenge Locations In Fortnite Battle Royale – Season 6 Week 4: This video guide will show you Season 6 Week 4 of Fortnite’s Battlepass Challenges that includes finding all of the Chest as well as the Shooting Galleries & Doorbells & Dancing locations around the map. Note: Week 4 challenges will be available on October 18th at 4am ET/8am GMT. This was an intended change to push back Weekly Challenges to Thursdays (since 4 months ago). That’s why they are not working until Thursday. 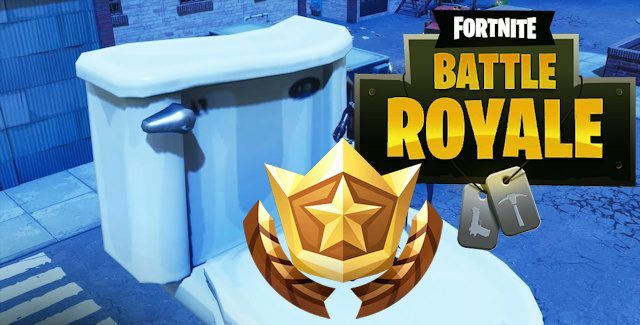 Note: Not all houses in Fortnite have doorbells, so here are the best landings spots for you to ring some enemies up. Tips: To complete this challenge, you need to go to the shooting galleries, step on the platform next to the scoreboard and shoot the targets that pop up. You only have a small time window where you can shoot the next target until the shooting gallery shuts down again and registers your current score. Tips: The Secret Battle Star is a Secret Banner in Season 6 Week 4. This means no free tier this week in Fortnite Battle Royal. To unlock the secret banner for week 4, you first need to complete FOUR sets from any of the weekly challenges (weeks 1-10). This unlocks a new loading screen with a hint. This week’s hint leads you to the very north-west of the map. Time to complete Fortnite Battle Royale’s Battle Pass Challenges for Season 6 Week 4!